The White-fronted Tern (Sterna striata) is the most common tern of New Zealand. It rarely swims, apart from bathing, despite having webbed feet. The species is protected. 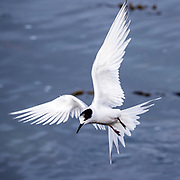 White-fronted Terns feed in large flocks by plunge diving on shoals of smelt and pilchards which have been driven to the surface by larger fish and are easily caught. Like all terns they fly with their heads and bills pointing down to see their prey. Breeding is between October and January in large colonies on rocky cliffs and offshore islands.